Microsoft certifications help grow your career. I received loads of queries related to SCCM CB and Intune Microsoft Certification. You can schedule SCCM Certification exam from Microsoft learning portal. As per my understanding, there is no point in taking Exam 70-696. The exam 70-696 is going to expire soon (Retiring on 31 March 2018). Update:- This course also is for individuals who are interested in taking Exam 70-703: Administering System Center Configuration Manager (SCCM) and Cloud Services Integration. Courses 20703-1A and 20703-2A, or equivalent knowledge and skills, are necessary to prepare for this exam. The exam 70-696 is the latest one but it’s going to expire soon. My recommendation to take the exam 70-703 (Thanks to Subrahmanyam Venkata) if you want to get a Microsoft certification on SCCM Current Branch and Intune technologies. This Exam 70-703 is not available in the following link https://www.microsoft.com/en-in/learning/exam-70-703.aspx. I hope this Microsoft certification exam 70-703 will be available soon. SCCM CB and Intune Microsoft Certification options are available at Microsoft learning website. The list of available exams is listed in the link here. The one Microsoft certification exam available for SCCM and Intune is 70-696 Administering System Center Configuration Manager and Intune. I don’t see any value in passing Microsoft certification exams using the exam dump files. I have a post which will help to learn SCCM and Intune systematically. Also, the method explained in the following post. Hope this post will help you to pass the exam 70-696. Learn How to start SCCM and Intune technologies. How to Convince your boss email for SCCM 70-703? Following is the helping hand from Microsoft to convince your boss to pay for your Microsoft certification exam. This content is available in the exam link above. I’d like to expand and prove my technical skills by earning a Microsoft Certification. My next step is taking Exam 70-703: Administering System Center Configuration Manager and Intune. The registration fee is <AMOUNT>. When I pass this certification, you’ll have proof of my ability to work with Windows 10, Windows Server 2016, Microsoft SCCM, Microsoft Intune. Microsoft has training and online resources to help me prepare for the exam. I believe I’ll be more effective and productive after achieving this valuable technical certification. Let me know if you have any questions. In the meantime, you can find out more about this exam at Microsoft Website Link (will update the link with 70-703 details once it’s LIVE). As you can see, the exam validates skills that are crucial to our team’s success. Save up to 50% on as many certification exams as you want (including Azure) when you register through Microsoft. More details are available here. 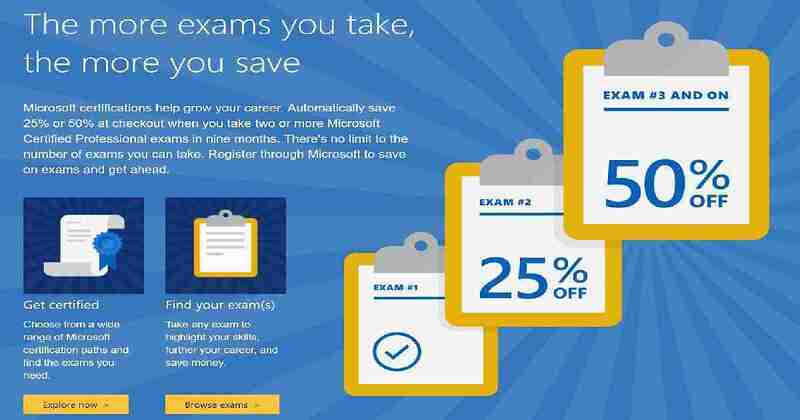 Automatically save 25% or 50% at checkout when you take two or more Microsoft Certified Professional exams in nine months. There’s no limit to the number of exams you can take. Register through Microsoft to save on exams and get ahead. My only comment will be there is no point of passing the exam without real world experience or at least in the lab. One cannot play with CB and Intune in Production environment. Also there are many things to consider, if you plan to get full exposure within home lab – that require Azure subscription and others that would cost money initially. I have been trying to get as much exposure as possible by using most of the Azure and CB features within the lab. Yet, I am still not fully comfortable to play in Production. That is my experience. Honestly speaking I know the pain. And I don’t think the experience SCCM admin like you can easily play in production environment. I don’t think there are loads of people who has cloud experience. Everyone is learning! I would have to agree here and many sccm admins don’t seem to be too willing to mentor colleagues in fear of having competition at the next org restructure. One hour once a fortnight was never enough for me and all I got exposure to, was making driver packs, app packages, collections, OSD task sequences and basic reporting. I’d did the labs for 70-696 and still failed the exam 3 times. Also these exams should be open book. I have ADHD that causes working memory issues and the only special accommodations I got was more exam time. Yes that is true. Most of the time SCCM/Intune admins are treating certificates as the shortcut to get promotion or good rating within the organisation. I don’t agree with that approach at all. From my perspective you have to prove the skills of SCCM in your organisation and implementing the best approaches for your organisation. In the long run, there is no point in having a certification and you don’t know how the product works. I receive several questions in different forums that whether I can the dump files for SCCM Intune Exam 70-703? If you are planning to write exam 70-703 using dump file then, you are not in the correct path. The “boss email” you provided is misleading because it is not about 703 but about the 696 exam which will be retired soon. Please correct it. As for the new exam. To be honest, I’m waiting for the 70-703 exam since last fall. I think I could pass 70-696 and, earlier, 70-243. However I’d like to pass a beta exam rather that pass an exam with thousands of dumps published over the internet. What disturbs me is the fact that the corresponding 20703 course does not contain topics about planning SCCM infrastructure (sizing, planning topology, site strategies, roles etc). At worst, the new exam could be simply an advertising of new and old Intune features and would recommend throw your on-premise SCCM away and move to the MS cloud. Yes, I’m against the exam dumps and that is why people genius SCCM admins are not getting proper credibility for passing the exam. I don’t think Microsoft is going to reduce their investments on SCCM. They are very much focused on both the device management products Microsoft Intune and SCCM (System Center Configuration Manager). Do you have any clues when and if there will be an exam ref book for this exam? Can’t find anything about it in Microsoft Press store.. Trying to register for 70-703 (beta) Exam and applying the RXRET703ZX code But no Luck. Any Clue whether it is applicable in India. This discount cannot be used with appointments scheduled in India. First of all, many thanks for opening this blog. I am concerned about Intune certification. I don’t see any certification barring 70-696 which says “Intune” on the exam name. As it is getting expired soon, I have stopped my plans for this certification. Even the exam 70-703 doesn’t say Intune and it is more concentrated towards new SCCM topics. Are you aware of any exams coming up in future related to Intune? OR do you think 70-703 is of any use at all for Intune admins? Ok. I think I will wait and see if not I will go for 70-703. But for now I am planning for 70-697 and if possible 698 too. You think it’s a good idea? I´m trying to buy this training book, but I do not find it. Even in Microsoft press store, there isn´t available 20703-1A: Administering System Center Configuration Manager. Could u please indicate where can I buy it? any free study resources / labs specific to 70-703? Has anyone sat the exam yet? It would be nice to know the complexity of it and where it really focuses. Haven taken numerous MS exams over the years, I often find the exams don’t always focus exactly where MS says they do. I am seeking your guidance on which Exam I should be opting. I did “243 TS: Administering and Deploying System Center 2012 Configuration Manager” few years ago. Shall I go for 703 ? I manage SCCM/SCOM & Windows 2012 R2\2016 and VMware environment. Hi Please go for the newest exam as I mentioned in the post. Could you suggest me which exam will be good start to acquire good knowledge in SCCM and becoming an Expert?